Ohio66 presents an in-depth look at the circumstances surrounding the departure of George Maharis from route 66 in the middle of the third season. 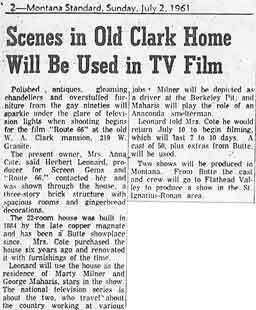 Polished antiques, gleaming chandeliers and overstuffed furniture from the gay nineties will sparkle under the glare of television lights when shooting begins for the film "Route 66" at the old W. A. Clark mansion, 219 W. Granite. 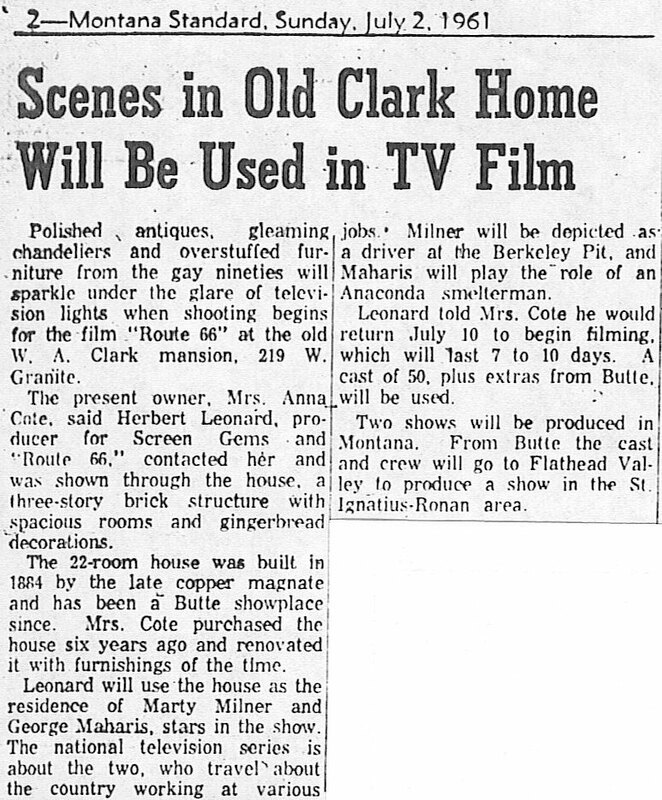 The present owner, Mrs. Anna Cote, said Herbert Leonard, producer for Screen Gems and "Route 66" contacted her and was shown through the house, a three-story brick structure with spacious rooms and gingerbread decorations. The 22-room house was built in 1884 by the late copper magnate and has been a Butte showplace since. Mrs. Cote purchased the house six years ago and renovated it with furnishings of the time. Leonard will use the house as the residence of Marty Milner and George Maharis, stars in the show. The national television series is about the two, who travel about the country working at various jobs. Milner will be depicted as a driver at the Berkeley Pit, and Maharis will play the role of an Anaconda smelterman. Leonard told Mrs. Cote he would return July 10 to begin filming, which will last 7 to 10 days. A cast of 50, plus extras from Butte, will be used. Two shows will be produced in Montana. From Butte the cast and crew will go to Flathead Valley to produce a show in the St. Ignatius-Ronan area. Two "Route 66" television shows will be filmed in the Butte area, it was reported Monday by Sam Manners, executive in charge of production who heads the large crew now arriving in Butte. About 10 members of the staff are here now and the others will come by chartered plane Tuesday from Hollywood. Manners said there will be about 60 people here for about two weeks to make the shows. Some of them also are bringing their families. "While we had planned to do our second Montana show in the Flathead country near St. Ignatius we encountered some production problems which caused is to change the locale to the Butte area," Manners said. "We hope we can return at some later time and do a show in the Flathead." The first show, entitled "A Month of Sundays," is to use the Butte mining operations as a background. The second will be a ranching story and it is tentatively planned to film it at the Corette ranch. Each show will take about seven days to make. Filming will start Tuesday afternoon. The "Route 66" shows are produced by Herbert G. Leonard [sic] Productions, Inc. and are sponsored by Chevrolet over Columbia Broadcasting System. The Leonard organization also produces "Naked City." 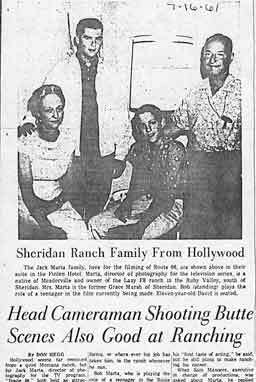 Jack Marta, a native of Meaderville who now owns a ranch near Sheridan, is head cameraman. Among the executives, in addition to Manners, who arrived over the weekend are Arthur Hiller, director; Max Stein, assistant director; Martin Milner, one of the stars and his wife and two children; Lenny Freeman, producer in charge of stories; John McCormack, art director; Gene Levy, auditor and office manager' Bobby Maharis, production assistant and brother of George Maharis, the other star of the show, and Lee Aaker, production assistant. Aaker was Corporal Rusty of the "Rin Tin Tin" shows. Personnel of the show are headquartering at the Finlen Hotel. Hollywood came to Butte Tuesday via "Route 66." The famous transcontinental highway is a long distance from the Mining City, but transplanting locales is accomplished readily, in the movies. A charter plane carrying the stars and feature players arrived at the Butte airport in mid-afternoon Tuesday, and filming of sequences to be used in a television enactment of a new "Route 66" episode began at once. Under the supervision of Sam Manners, executive in charge of production for Herbert B. Leonard Productions, Inc., the Hollywood group is here to do a "Route 66" show in an unusual setting. The situation concerns the adventures of a truck driver working in the Anaconda Co.'s Berkeley Pit and his pal, who is cast as a smelterman at the Anaconda Reduction Works. Arthur Hiller directs the show. Marty Milner plays Todd, the truck driver; George Maharis is Buz, the smelterman; beauteous Ann Francis has the feminine lead as Arline, and Conrad Nagel, veteran of countless motion pictures, TV productions and the Broadway stage, carries the role of a priest. The "Route 66" show acquires some genuine Montana flavor, aside from the Berkeley Pit and Anaconda smelter setting. Mike O'Connell, Butte contractor who has had parts in theater and television productions, has been signed to portray a bartender. Among O'Connell's credits are appearances in Jack Webb's radio "Dragnet" series and the "Badge 714" on television. He has played the lead in many of Butte's Little Theater off Broadway stage productions. Bob Marta of Sheridan is cast as a teen-ager. He is the son of Jack Marta, who is associated with the production end of "Route 66." Jack Marta, head cameraman for "Route 66," is a native of Meaderville. 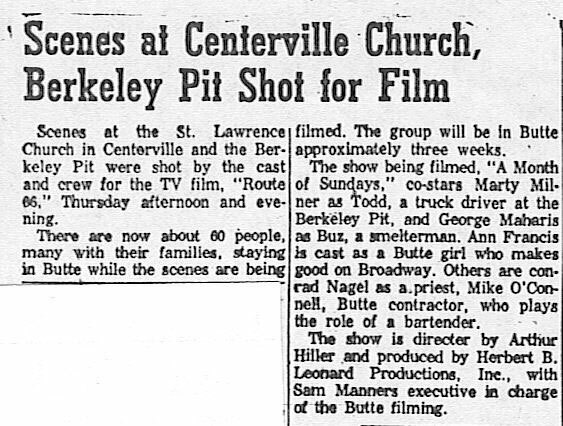 Scenes at the St. Lawrence Church in Centerville and the Berkely Pit were shot by the cast and crew for the TV film, "Route 66," Thursday afternoon and evening. There are now about 60 people, many with their families, staying in Butte while the scenes are being filmed. The group will be in Butte approximately three weeks. The show being filmed, "A Month of Sundays," co-stars Marty Milner as Todd, a truck driver at the Berkeley Pit, and George Maharis as Buz, a smelterman. Ann Francis is cast as a Butte girl who makes good on Broadway. Others are Conrad Nagel as a priest, Mike O'Connell, Butte contractor, who plays the role of a bartender. 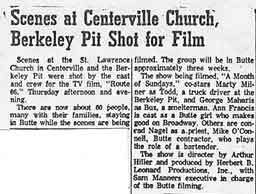 The show is directed by Arthur Hiller and produced by Herbert B. Leonard Productions, Inc., with Sam Manners in charge of the Butte filming. Route 66 detoured Friday to 235 W. Copper for the next three days to shoot boarding house and street scenes for the TV show currently being filmed in Butte. The two-story, white frame house, located high on a hill overlooking the city, us the home of Pat Gibbons. 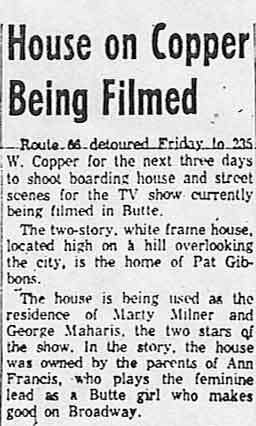 The house is being used as the residence of Marty Milner and George Maharis, the two stars of the show. 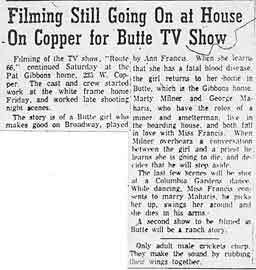 In the story, the house was owned by the parents of Ann Francis, who plays the feminine lead as a Butte girl who makes good on Broadway. WARNING! SPOILERS! This article reveals the entire plot! Filming of the TV show, "Route 66," continued Saturday at the Pat Gibbons home, 235 W. Copper. The cast and crew started work at the white frame home Friday, and worked late shooting night scenes. 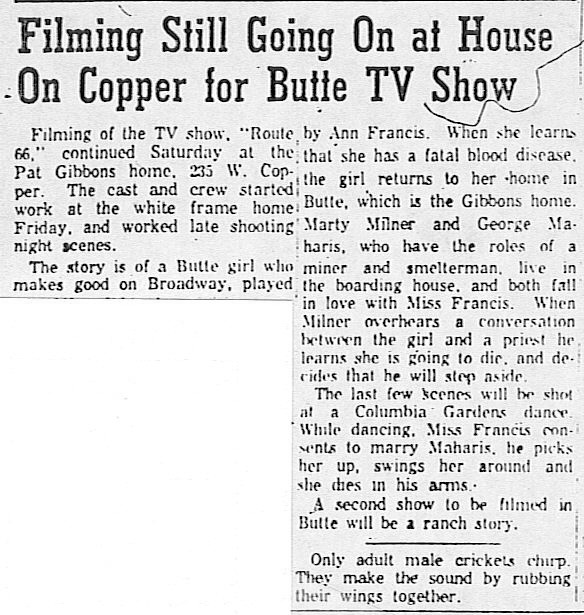 The story is of a Butte girl who makes good on Broadway, played by Ann Francis. When she learns that she has a fatal blood disease, the girl returns to her home in Butte, which is the Gibbons home. Marty Milner and George Maharis, who have the roles of a miner and a smelterman, live in the boarding house, and both fall in love with Miss Francis. When Milner overhears a conversation between the girl and a priest he learns she is going to die, and decides that he will step aside. The last few scenes will be shot at a Columbia Gardens dance. While dancing, Miss Francis consents to marry Maharis, he picks her up, swings her around and she dies in his arms. A second show to be filmed in Butte will be a ranch story. The Jack Marta family, here for the filming of Route 66 are shown in their suite in the Finlen Hotel. Marta, director of photography for the television series, is a native of Meaderville and owner of the Lazy F8 ranch in the Ruby Valley, south of Sheridan. Mrs. Marta is the former Grace Marsh of Sheridan. Bob (standing) plays the role of a teenager in the film currently being made. Eleven-year-old David is seated. Hollywood seems far removed from a quiet Montana ranch, but for Jack Marta, director of photography for the TV program, "Route 66," both hold an attraction. Marta, a native of Meaderville, calls both Los Angeles and Sheridan his home. When he isn't behind a television camera in Hollywood, his time is spent on the family's ranch, the Lazy F8, in the peaceful Ruby Valley, five miles outside of Sheridan. Marta, who is head cameraman for the national TV series, has watched the glamorous make-believe world if movies and television for nearly 25 years. Born in Butte, the son of Mr. and Mrs. John Marta, he attended schools here and in Meaderville. He graduated from high school in Los Angeles after the family moved from California. His career as a top cameraman started in the laboratory of the old Fox Studios. Later he went to 20th Century, then on to Republic where he worked for 22 years. He began working in the television field in 1957. While working with the motion picture industry Marta helped film over 300 movies, many of which were top attractions starring the most famous Hollywood stars. When asked if he spends much time at his Montana ranch, Marta replied, "As much as possible." Mrs. Marta, the former Grace Marsh of Sheridan, and their two sons, Bob, 18, and David, 11, spend summers and holidays at the ranch. Marta commutes from California, or where ever his job has taken him, to the ranch whenever he can. Bob Marta, who is playing the role of a teenager in the Route 66 show now being filmed, plans to enroll in Montana State College in Bozeman this fall and take agriculture. His part in the show is his "first taste of acting," he said, but he still plans to make ranching his career. When Sam Manners, executive in charge of production, was asked about Marta, he replied emphatically, "He's the best cameraman there is!" And to his friends in Sheridan, he's a pretty good rancher too. The end of the road for "Route 66" will be at Columbia Gardens Wednesday night. Filming of the TV show concludes there after two days of shooting the Garden's scenes, concessions and dancing Tuesday and Wednesday night. Young couples will be admitted free at the dance both nights, Sam Manners, executive in charge of the production, said Monday. It was not know then what time the dances would start. Work at the Pat Gibbons home at 235 W. Copper, begun Friday, was completed Monday afternoon and evening street scenes were shot at Hennessy's and the Hotel Finlen. A second show, a ranch story, also will be filmed in Butte. Butte was chosen as the site for two filmings of "Route 66" because of "the character of the town, surroundings and terrain," Butte Rotarians were told Thursday. Jerry Thomas, assistant producer for the TV programs being filmed here, was the speaker. He was presented to the club by Bob Wilhelm, program chairman. Thomas told the Rotarians the first script has been filmed and the crew now is shooting a ranch story which centers around the struggle of a man and a killer horse. Much of it is being filmed on the R. D. Corette ranch, south of Butte. In a question and answer period, Thomas said that the "Route 66" crew will go from here to Pittsburgh, Philadelphia, Boston and Los Angeles in that order; that for the ranch story two horses had to be shipped from California because the "actor" horses are a necessity; that the title of the series was chosen to suggest and signify youth and action combined in a search for a place to settle down. When asked why the first film is photographed in the oldest, most run-down part of the city, even in the oldest church, Thomas answered that "there's a pretty old church right in Rome itself, and that the script is about a poor family who live in the poorer section of town." He added that scenes of Columbia Gardens and other places will more than offset any bad public relations about Butte. Other points of interest revealed that the target is to keep production 10 weeks ahead of release dates, but that sometimes the gap is only three weeks; that "today's script came in the mail Tuesday of this week;" that this is the only crew shooting the "Route 66" series, that for "Naked City" another top-rated TV show, the crew sometimes must resort to putting police uniforms on their own extras to control New York crowds in the absence of cooperation from N.Y. Police; that they negotiate with 50 separate inions who are involved in the production of one one-hour TV show; that they carry a permanent production crew of 44; that the budget for each show runs about $110,000 for the six to seven days it takes to film it, but that costs usually average $130,000 per show. He emphasized that the shows use as many local people as extras and technicians as possible. Guests at the meeting which was presided over by President C. R. Haser included Rev. Walter Marshfield, Dr. S. B. Adelsberg and Frank Romano. Visiting Rotarians were William Schimme, Scotsdale, Ariz., Hector Smith, San Angelo, Texas, and Boll Orton, Coos Bay, Ore.